This is a special formula when facing increased belching and spitting. 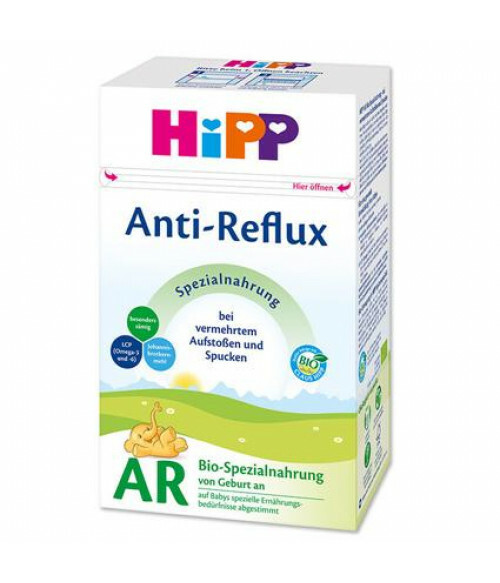 In case your baby more often spits, HIPP anti-reflux organic milk is your ideal choice. This first milk prevents backflow into the esophagus. HiPP anti-reflux organic milk contains high quality locust bean gum. This is causing specially creamy consistency of the milk and ensures that it much better stays in the stomach. Thus, the reflux to the esophagus is decreased. With locust bean gum – especially creamy. LCPs (Omega 3 & 6). Ideal in Cases of Increased Burping & Spitting-Up. For the Dietary Management of Reflux & Regulation or Special Medical Purposes. Ask for Advice from Your Healthcare Professional Before Use. Thick and Creamy. Easily Digestible. ORGANIC SKIMMED MILK, ORGANIC WHEY, ORGANIC VEGETABLE OILS [ORGANIC PALM OIL, ORGANIC RAPESEED OIL, ORGANIC SUNFLOWER OIL], ORGANIC MALTODEXTRIN, LOCUST BEAN GUM, ORGANIC LACTOSE, CALCIUM CARBONATE, LONG CHAIN POLYUNSATURATED FATTY ACIDS (LCP OILS) [FISH OIL, VEGETABLE OIL FROM MORTIERELLA ALPINA], CALCIUM CHLORIDE, CALCIUM ORTHOPHOSPHATE, L-TYROSINE, POTASSIUM CHLORIDE, VITAMIN C, L-PHENYLALANINE, L-TRYPTOPHAN, ZINC SULFATE, IRON SULFATE, LACTIC ACID, MAGNESIUM CARBONATE, NATURAL LACTIC ACID CULTURE [HEREDITUM® LACTOBACILLUS FERMENTUM CECT5716], NIACIN, SODIUM CHLORIDE, VITAMIN A, VITAMIN E, PANTOTHENIC ACID, COPPER LYSINE COMPLEX, VITAMIN B1, VITAMIN B6, VITAMIN B2, POTASSIUM IODATE, MANGANESE SULFATE, FOLIC ACID, VITAMIN K, SODIUM SULFATE, VITAMIN D, BIOTIN, VITAMIN B12.